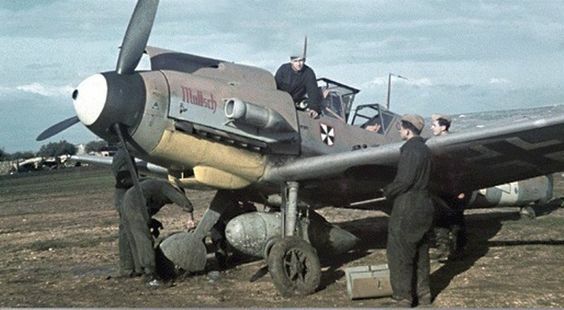 8 November 1940 - a small formation of three Heinkel He 111 H-4 torpedo bombers under the command of Oberleutnant zur See Helmut Lorenz came into land on the airfield at Brest- Guipavas, or Brest Nord as it was known in the Luftwaffe. This small detachment of aircraft and crews belonged to 1./KGr. 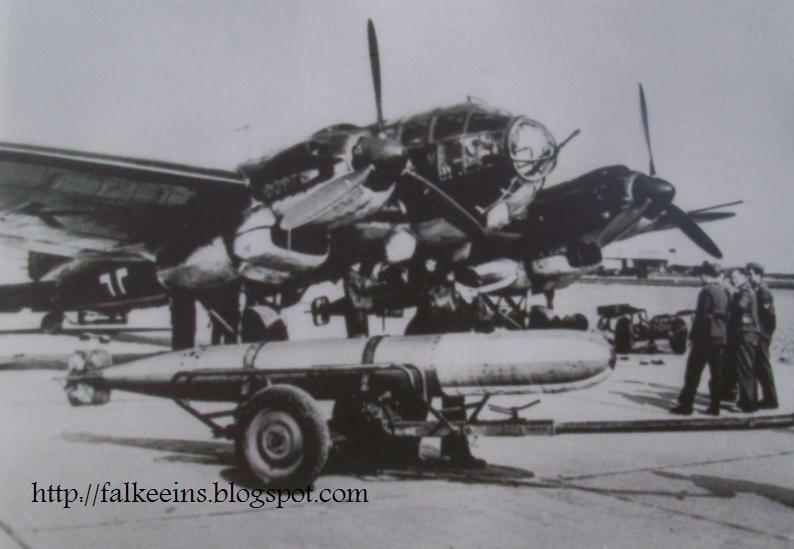 126, the Staffel selected to perform operational testing of the He 111 in the role of torpedo launching bomber, a mission previously carried out solely by Heinkel He115 floatplanes. Kampfgruppe 126 was established from III./KG26 in February 1940, then based in Nantes -Château Bougon with around thirty He 111s on strength which were deployed for mine-laying and anti-shipping bombing sorties. The following day, 9 November, at around 13h00, Oblt. Lorenz (left) was ordered to fly a sortie against a Royal Navy convoy that had been spotted in the Irish Sea. Weather conditions were poor, with low cloud and visibility from three to five kilometres. Two of the recently arrived He 111 H-4s were hurriedly readied, loaded with fuel, bombs and two torpedoes were slung under the fuselage of each aircraft. 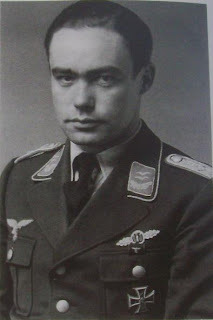 At 14h00 the two Heinkels were airborne with Lorenz commanding the formation in the aircraft piloted by Feldwebel Walther von Livonius "1T+FH" (WNr. 6951). The other members of the crew were radio operator Feldwebel Peter Hermsen and flight engineer Flieger Otto Skusa. As the aircraft climbed for height the flight engineer busied himself loading the magazines and running his checks. Shortly after taking off the radio equipment in this machine failed but was working again as the aircraft headed out over the coastline and out into the Atlantic. Weather conditions improved with the ceiling now at 1,000 metres. Suddenly Fw. Hermsen shouted out a warning over the intercom; " an aircraft closing from astern at high speed - a heavy fighter, type unidentified.." It was 14h16. The unidentified fighter was in fact a Blenheim Mk IVF coded FA-Q of 236 Sqn. Coastal Command, a long-range fighter variant of the Blenheim bomber touting 6 Browning machine guns, four in a dorsal fuselage pack. At the controls was twenty year old Pilot Officer Dugald Lumsden - the two remaining crew were navigator Sergeant Gibbons and radio operator/gunner Sgt. Miles. They had taken off at 13h30 (12h30 UKT) from St. Eval in Cornwall for a reconnaissance sortie over Brest. 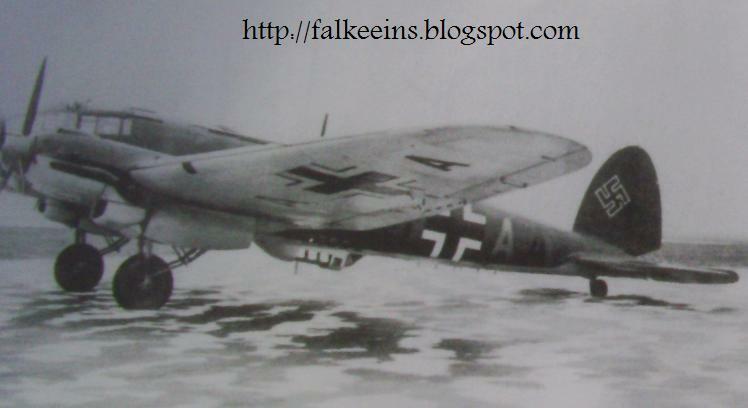 Having already ditched one KGr 126 Heinkel He 111 von Livonius knew what would happen next " Don't worry . ;" he shouted to his comrades, ".. the aircraft will float back up ..". Which is exactly what it did. Once on the surface the crew scrambled for the cockpit door and jumped out onto the wing. With blood streaming from his wounds Fliger Skusa shouted from the radio operator's position that he was unable to release the dinghy. Walther von Livonius climbed back into the fuselage, struggled to the rear of the aircraft and pulled the life raft from its station still in its cover. He passed it outside the aircraft to Oblt. Lorenz who had torn off its protective sheet and pulled the toggle on the gas cannister used to inflate it. It took twenty seconds to inflate the raft. The pilot was meanwhile helping the flight engineer out of the ditched machine before the two men wrestled him into the dinghy. Von Livonius went back into the sinking aircraft one last time to pay his final respects to his dead radio operator, Peter Hemsen..
As he climbed back out of the airframe Feldwebel von Livonius lost his footing and slid off the wing into the sea. It was then that the three men noticed the air bubbling away out of the raft - holed by the Blenheim's salvos. Attempting to inflate their life vests, their fingers numbed by the cold, the men found it almost impossible to unscrew the small compressed air bottles designed for this purpose. They finally managed it after several attempts. Before the dinghy sank Lorenz retrieved the flare gun and the small container of flares and attached it around his neck. Supporting the head of his wounded comrade out of the water he also managed to retrieve the canister of coloured dye designed to be released into the water to help search aircraft locate them. By now the Heinkel had slid under the waves and had disappeared for good. It was 14h45. The three men were more than 15 kilometres from the Brittany coast line - which they could vaguely make out in the far distance when at the top of a wave. The swell was running high and gradually the three men drifted further and further away from each other. While Flieger Skusa and von Livonius clung onto each other Lorenz was soon forty or fifty metres away from them and could catch only brief glimpes of the two men inbetween the waves. More than an hour passed. Half drowned, paralysed with cold and their life jackets slowly deflating, von Livonius and Skusa were in desperate straits. And when the pilot had to let go of his wounded comrade in order to re-inflate his life jacket, Otto Skusa - unable to swim, half-dead through loss of blood and the cold - slipped under the waves and disappeared. The two survivors had by no means given up hope of rescue. And while they had been unable to use the radio which had been shot up during the Blenheim's attack, they still has the signal flares which Oblt. Lorenz fired off at regular intervals. Von Livonius had already emptied out the yellow dye canister into the sea. What they didn't realise during these dreadful moments was that their encounter with the Blenheim had been witnessed by men of the Wehrmacht based on the coast. Reports had been rapidly passed to the local Luftwaffe units in order to identify the aircraft and a trawler had been commandeered and had already put to sea heading in the general direction of where the Heinkel had been seen to come down. Rescue was possibly closer at hand than they could have imagined. At 14h27 KGr.126 Staff had contacted 1./Seenotflugkommando based at Lanévoc-Poulmic (south of Brest) to advise of a probable ditching in square 59521 north of the Ile d'Ouessant some fifteen kilometres offshore. Thirty five minutes later a Breguet 521 Bizerte seaplane coded KD+BC and piloted by Leutnant Paul Metges took off for the area - with at least 90 minutes of loiter time according to the pilot- in order to pinpoint any potential survivors. It was obvious though that even if he located anyone in the sea the pilot would find it impossible to land given the heavy swell and that he could only hope to 'guide' the trawler to the zone.